When will everyone in India have a bank account? It is difficult to answer that, but Eko India Financial Services has taken up this challenge to reach out banking services to 40 per cent of the un-banked population in India. Eko helps anyone who owns a cellphone to do banking transactions in just a few seconds. Launched by Abhishek Sinha, the company helps the poor in wealth creation by saving as little as Rs 10. After quitting Satyam Computers, Abhishek co-founded Six DEE Telecom Solutions, a telecom value-added services company. He exited Six DEE in February 2007 to pursue his ambition of making cellphones a financial identity for people at the bottom of the pyramid. Today, thanks to Eko, over 100,000 people have been connected to the banking network through mobile banking. Click NEXT to read more about Abhishek Sinha's trials and tribulations in this unique process of wealth creation . . . 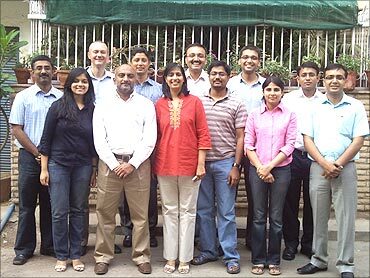 Image: Team Eko at their Delhi office. A chance meeting with former President A P J Abdul Kalam at an airport had a profound impact on Abhishek and his vision for the future. The President told Abhishek that as a country of young, enterprising and skilled people, we must look to create wealth through entrepreneurship. 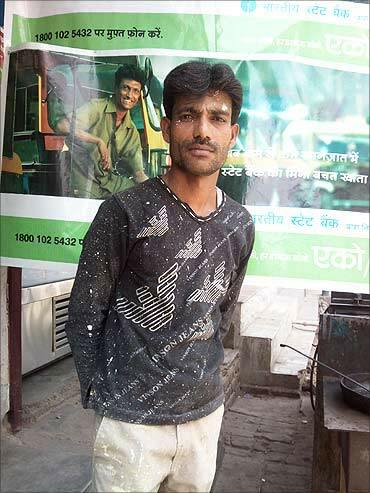 So Abhishek gave up a corporate job to become a social entrepreneur. "We provide people access to a no-frills bank account and an off-the-shelf insurance policy that a customer can acquire in less than 15 minutes from a neighbourhood store," Abhishek Sinha, CEO, Eko India, a Nasscom Emerge 2010 winner. "We also provide the ability for these customers to deposit cash, withdraw cash, remit funds and pay the insurance premium at these local kirana stores, all in a matter of seconds. Recently we had customers in rural Bihar using Eko as the only means of transacting money when they were cut-off by floods," he says. Click NEXT to read more about this unusual initiative . . . 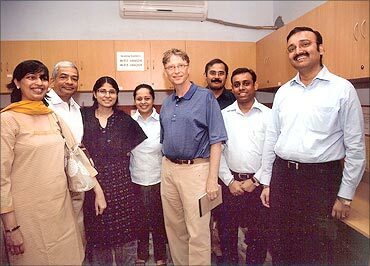 Image: Bill Gates, Abhishek Sinha (R) at Eko office in November 2008. Tell us more about Eko India Financial Services. What kind of services does it offer? Eko is based on the fundamental premise of reducing the cost of secure financial transactions and providing an extremely intuitive user interface such that access to financial service can be democratised. Currently, Eko works as a business correspondent of the State Bank of India and ICICI Bank, and as a distribution partner of Bharti AXA Life Insurance. We provide people access to a no-frills bank account and an off-the-shelf insurance policy that a customer can acquire in less than 15 minutes from a neighbourhood store. We also provide the ability for these customers to deposit cash, withdraw cash, remit funds and pay the insurance premium at these local kirana stores in a matter of seconds. What was the idea behind starting a company to offer financial services for the poor? The intent was to create a company that would be able to lower the cost of a financial services transaction without any change in the quality of service. It is incidental that our current customer segment is largely 'low-income' users. But the need for small value transactions is universal. Image: A prospective customer examines the Holi offer to send money home. What kind of constraints did you face initially? We went through all the usual constraints a start-up faces. Convincing our first partner bank, convincing the first telecom partner, getting the business model right, building the right team, finding funding -- we joke in Eko that we have built an intellectual property through our trials and errors. How many people have benefited from Eko? We have serviced over 100,000 customers, including banking, insurance and remittance users. It would be vain for us to guess how many customers have benefited significantly. We feel we are providing some benefit as we see a rise in the number of customers using our services. 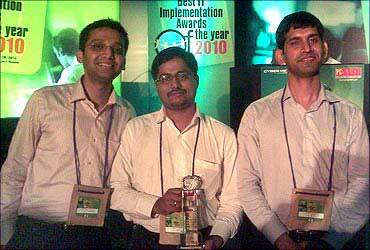 Image: Abhinav Sinha, Anupam Varghese and Harish Lodwal with the Best IT Implementation Award 2010. How do you approach villagers? Are they reluctant, how difficult it to convince them? Our whole model is based on building on the trust within the community. The customer service point (CSP) that we appoint is in several cases recommended by the village elders as someone they trust. The challenge in rural areas is to establish our credentials as an authorised agent of the bank. We have used local level marketing programs to create financial and service awareness. Our channel managers as well as CSPs spend time explaining the service and its benefits. It takes time, but once there are a certain number of people using the service, word of mouth in rural markets helps overcome entry barriers. How safe is the mobile banking medium? Are villagers able to do transactions easily? We use a patent filed mechanism for securing our transactions. We have so far had no issues of fraud -- but we continue to work towards improving transaction security. We have paid special attention on making the mechanism very simple and based on existing user behaviour of number dialling, so that the learning curve is very low. So after about 2-3 attempts, most of our customers are comfortable with the transaction. 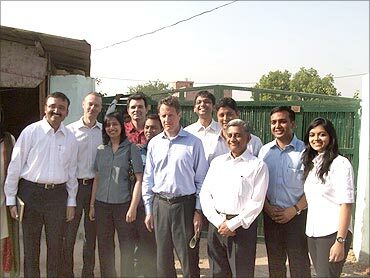 Image: US Treasury Secretary Timothy Geithner and Diwakar Gupta, Dy. MD, SBI with team Eko. How big is the challenge of financial inclusion in India? 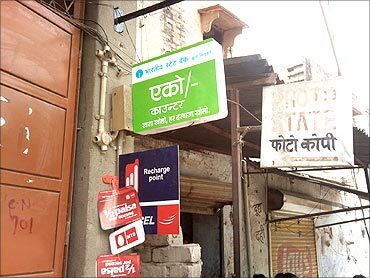 How can banking services be extended to remote villages? Financial inclusion is a very broad term in its sweep. Providing people a bank account is the first baby step of 'inclusion'. Even on that count, we still need to cover 40 per cent of our people (based on anecdotal data). Then one needs to get people to actually use the services - or transact; we would then require to take each customer through the pyramid of financial services offerings from simple products like term deposits, remittances and life insurance to higher order financial products like loans, pensions and ultimately even participation in capital markets. It is an enormous challenge! In order to extend reach, we need to look at business models that offers very cost of starting up service delivery, technologies that provides real-time or near real-time settlement and extremely simple user interfaces. Finally, we need to pursue all models that can scale. Image: Brijesh Kumar, painter and Eko customer. What kind of problems do villagers face? With respect to account opening, sometimes the problem is quite basic: such as not having a studio or a photocopying machine in the village where they can give us a photograph or document copies! With respect to our service, we occasionally find that customers are a little nervous if they don't receive an SMS receipt on time. However, the customer service point and our call centres are usually able to resolve the issue. What kind of business potential does this sector offer? With the recent guidelines from the Reserve Bank of India on pricing, the potential is extremely large; the recent listing of a well-known MFI (micro finance institution) will give you a sense of how much investors believe in this sector. Perhaps there is still a need to evolve a published framework that increases the number of players involved. That will bring in innovation. 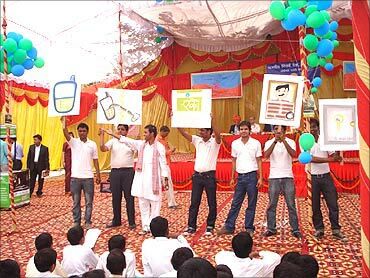 Image: Promoters explaining branchless banking with Eko to villagers in Khera Dabar at an RBI function. We have invested over Rs 10 crore (Rs 100 million) so far including grant funding from Consultative Group to Assist the Poor (CGAP) and Gates Foundation. What kind of positive changes have come about after you connected people with banking services? We have come across several heartening changes - particularly in cases where the customer has acquired a bank account for the first time through Eko. We have many instances of customers saving small sums of money -- as little as Rs 10-20 at the end of a day. We have customers who have set goals and save towards meeting these targets -- ranging from medium-term goals of buying a motorcycle to long term goals of getting their children married. We have customers in Delhi where a factory owner who is an account holder remits monies to the relatives of his employees to an account holder in Bihar. We have customers opening a bank account in their names and allowing their children to save their pocket money on a weekly basis. All of these are very encouraging for us. Image: A customer asks a CSP in South Delhi for clarifications from the leaflet. The scaling up of operations and organisation building would be our major challenges going forward after we secure funding. Is this a profitable business? How have the revenues grown? Have you started making profits? This is certainly a profitable business. The RBI has recently recognised the need for sustainability and even allowed for-profit companies to become banking correspondents. Revenues are certainly looking up and, in some products, the growth is extremely encouraging. We still have a while before we will make profits, but we are confident that we will get there. 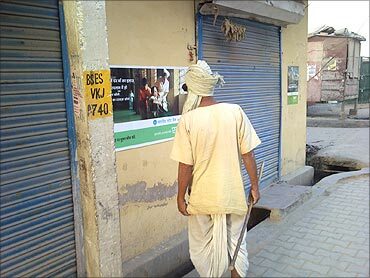 Image: A rural customer examines a poster of Eko. 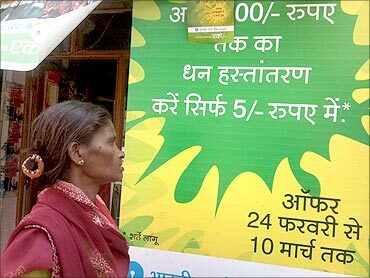 What's your target in terms extending banking services to villages? In the next one year the target will be to directly have a presence in all the villages with a population of 6,000 or more in Bihar. In the second phase -- for villages with population less than 6,000 -- clusters will be formed and customer service points will be created for servicing customers in each cluster. In NCR/ Delhi region all villages will be covered with CSPs. Unwavering faith in their idea. Dogged persistence to not give up. Family and friends who will support you financially, as well as emotionally! 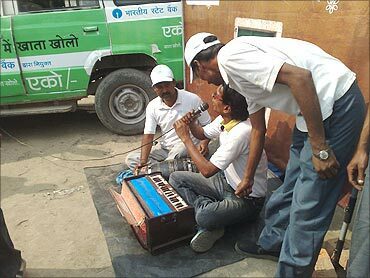 Image: Actors trained by Eko start a "nukkad natak" in Bihar to educate rural customers about SBI-EKO. There is a need for more awareness. I must acknowledge the efforts by National Entrepreneurship Network to bring this awareness in college students that entrepreneurship is a good alternate career option with potentially good returns. The government must create policy frameworks for organisations similar to Y Combinator/Tech Stars/founder institutes to be formed in India for nurturing young entrepreneurs. In the short-term (6 months), we are focussed on expanding services in Delhi-Bihar. We will examine expansion plans in other locations in due course based on business imperatives. Image: Shop signage play a crucial role in reinforcing trust at neighborhood stores.